Diagnostic Automation offers a HIV 1, 2 ELISA kit is an enzyme-linked immunosorbent assay for the qualitative detection of antibodies to HIV type 1 (group M-O) or type 2 in human serum or plasma samples. The HIV 1, 2 ELISA assay Kit is designed as an aid for screening of blood donors and/or as an aid in diagnosis of clinical conditions related to infection with HIV-1 and HIV-2, the etiological agents of AIDS. The Sensitivity of the HIV 1, 2 ELISA kit is 100% and the Specificity is 99.89%. HIV-1 was thought to be the only cause of these syndromes until 1986, when a second type of Human Immunodeficiency Virus (HIV-2) was isolated and also reported to cause AIDS (acquired immunodeficiency syndrome). Both viruses have the same morphology and lymphotropism, and the modes of transmission appear to be identical. In addition, HIV-1 and HIV-2 genomes exhibit about 60% homology in conserved genes such as gag and pol. Serologic studies have also shown that the core proteins of HIV-1 and HIV-2 display frequent cross-reactivity whereas the envelope proteins are more type-specific. Despite this immunologic cross-reactivity, detection of antibodies to HIV-2 with any of the licensed HIV-1 enzyme immunoassays is highly variable. 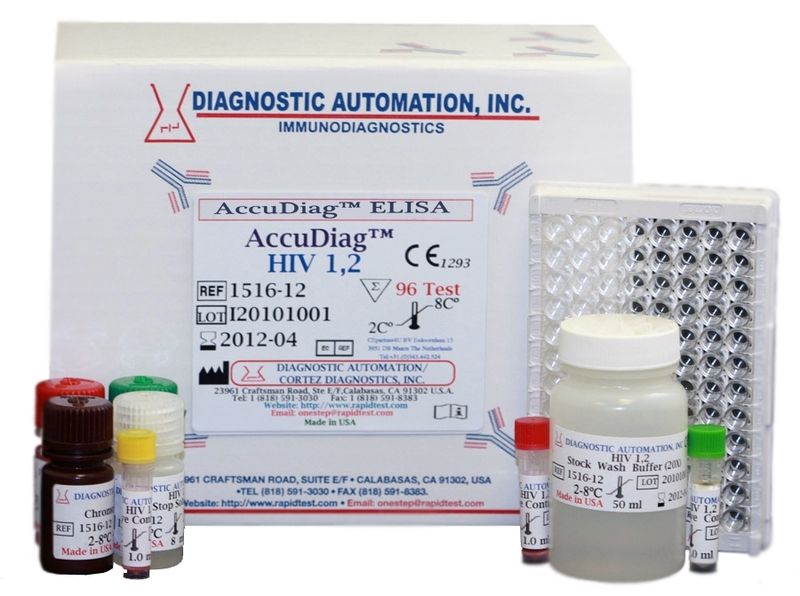 This HIV1/HIV-2 ELISA kit was developed to detect antibodies to HIV-1 and /or HIV-2, for blood screening and diagnostic purposes. Testing for the presence of HIV antigens or antibodies from serum brings serological evidence of infection from individuals that may be harboring the HIV virus. Detection of antigens can be evidenced in both the acute phase and symptomatic phases of AIDS. However, the HIV-1 and HIV-2 antibodies can be identified all through the entire infection period - beginning at the acute phase all the way through the last stages of AIDS. For the serodiagnosis of HIV infection, the best approach is use of highly sensitive antibody ELISA tests. The predominant path of HIV infection is blood transfusion (independent of the other dominant carrier - sexual transmission). All donated blood or plasma is tested because HIV can be present in both cellular and cell-free fractions of human blood. This creates a high risk transmission rate if not tested properly. Thus, HIV ELISA kits can be an important screening tool. Polystyrene microwell strips pre-coated with recombinant HIV antigens indicated make up this two-step incubation antigen sandwich enzyme immunoassay kit (HIV1, 2 ELISA). In the first incubation step, the patient's plasma or serum sample is added. If specific HIV1/2 antibodies are present, they will be captured inside the wells. Afterwards, microwells are washed to remove unbound serum proteins. After this stage the second set of recombinant antigens conjugated to the enzyme Horseradish Peroxidase (HRP-Conjugate) is added. While the second incubation occurs, these antigens will bind to the captured antibody. The chromogen solution is added to the wells, after wash (to remove unbound conjugate). In the wells where the antigen-antibody-antigen (HRP) sandwich immunocomplex is taking place, the colorless chromogens are hydrolyzed by the bound HRP conjugate to a blue-colored product. After, the reaction is stopped and the blue color turns yellow. individual patient CD4+ count and/or Western Blot (WB) or NAT. are unaffected from elevated concentrations of bilirubin, hemoglobin, and triolein.